Nhu Vuong ’05 has come a long way since she began her career at UCI just over four years ago. Vuong, an information and computer science major, is now a software engineer at Google and working on building a company-internal web application. An Extreme Computing winner, Nhu keeps in close touch with her team members. “Extreme Computing gave me a good opportunity to work with a group of some of my closest friends and explore the business side of technology – something that lit a spark for all of us,” says Nhu. “Project classes like ICS 125 taught me what it really meant to work with a team of diverse skills and personalities and have to stick together to deliver a fi nished product at the end of ten weeks,” says Vuong of her experience in ICS and how it has helped her develop as a career person. 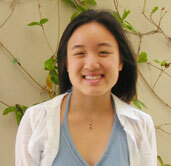 She also participated in the Campuswide Honors Program and as a SAGE scholar. Under the guidance of Dean Richardson and Dr. Suzanne Schaefer, Nhu also produced, directed and edited a documentary about women in technology which allowed her to explore her interests in fi lm and the social aspects of computer science – specifically, for young women. Now with her free time, she enjoys cooking, reading, music, stand-up comedy and photography. As for Nhu’s future? She hopes to have her own business one day.